Well okay, not exactly light reading but I couldn’t title the blog post heavy reads that make you think a lot, because it doesn’t quite have the same appeal. This is another combination review post, because I wanted to mention two recently read books that although I don’t feel obliged to review (both borrowed from work friends) I think they are both very much worth sharing. “A sly, cheeky and blackly comic telling of mothering, heartache, heartbreak, desire, love and death.”- from synopsis. It’s definitely all of that. Working in the perinatal field, a colleague lent me a copy of Mother’s Grimm to read. She said it was a book of fairytale inspired short stories with a darker spin. Well, she warned me. The stories sure were dark! Danielle Wood very cleverly rewrites fairytale stories of mothering layering it with the realities of life from a cynics view without the happily ever afters. Did I mention there are no happily ever after? With each story I’d get to the end and think to myself, Oh. I’d have to remind myself there’s no happy endings! I may not be entirely selling the book to readers just yet. But what the author does so well, is get into the mindset of mothers; their triumphs, demons, desires and grief. If you’re a mother and you’ve ever felt like the crappiest mother alive, or compared yourself to that beautiful pregnant goddess in your yoga class or just felt like doing the best you can isn’t good enough- then you’ll probably enjoy the dark humour and realistic insights that Wood puts forth in Mother’s Grimm. This book was lent to me by another colleague, who simply slipped it into my hand and walked away. 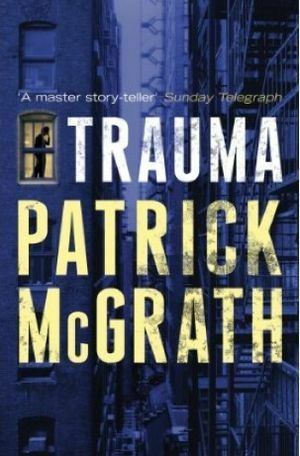 It was titled Trauma and from a quick glance at the back page blurb I could see that the main character was a psychiatrist with emotional issues. Right up my alley, I thought! The story delves right into the analytical mind of psychiatrist Charlie Weir. Written in first POV, Charlie is a character that may divide the reader. He’s a bit of a know it all who seems to psychoanalyse everyone including himself, but as the story unfolded I became increasingly irritated with his distorted sense of self-awareness. Trauma, makes a very good point. That even those trained in the workings of the mind, can succumb to all those nasty psychological defences their patients present with. After all, doctors are only human. It’s a quick, heavily introspective but appealing novel from an author previously unknown to me. Will check out his backlist! Mother’s Grimm counts toward the 2014 Australian Women Writer’s Challenge. Next postMerry Christmas and Happy Holidays! I read Mother’s Grimm a little while back and I have to agree with you about that ‘Oh’ feeling. Some of those stories are quite, wickedly, truthful. I liked the brilliance of the storytelling, but I’m not sure how comfortable I was with the book as a whole. Trauma sounds like an interesting read. Yes, I know what you mean Kathryn. It’s not a book I could say I loved, because it didn’t leave me with any warm, fluffy feelings! But, it was fascinating and thought-provoking. I enjoyed two of the stories more than the other two. MothErs Grimm is on my wishlist. Wishing you a happy reading week and a joyful holiday! Thanks Shelleyrae. Mother’s Grimm is a fairly quick read, it’s a short book with just a few short stories- though not something you want to pick up right before bed!